Despite the global threat of overfishing, the subtropical waters of northern New Zealand are, still to this day, home to some of the most abundant fisheries on the planet. Keen anglers flock in their hoards from around the world each year to enjoy a piece of the big game action, providing a welcome boost to our booming tourist industry here in paradise. Our modern international reputation for game fishing can be traced back to one man. Zane Grey (January 31st 1872 – October 23rd 1939) was an American bestselling author, most notable for his extensive collection of Western novels. During and after his life he published more than 90 books which sold in excess of 40 million copies, and has since had well over 100 films based upon his works. Grey was not only a renowned author, but, like many in the world in that exciting era of globalisation, also an intrepid explorer. Famous for his passion about fishing, Zane Grey used his wealth to travel all over the world in pursuit of a good catch. In 1925, years after his publishing career had first taken off, he was invited to visit New Zealand by our government, in the hope that he would enjoy and promote our fishing industry. They made a good call. The following year he set sail and arrived, with his entourage, on the shores of Cape Brett in the Bay of Islands. Grey was blown away by the natural beauty and quirky culture we all know and love about New Zealand, but more than this, he was impressed beyond description with the game fishing opportunities he discovered in our thriving marine environment. He introduced New Zealanders to sport fishing for marlin and shark for the first time, and caught many enormous fish of his own during his visits to the Bay of Islands. He also scored a number of world records for all-tackle deep sea fishing in New Zealand’s waters, the most impressive of which was, arguably, a 111lb whopper of a Yellowtail Kingfish he pulled out in 1926. Another Grey legacy that has seen successful longevity in New Zealand is his invention of the teaser, a type of hookless bait, which is still used to this day to attract fish. Unable to stay away, Grey returned to the Bay of Islands many more times over the subsequent years, choosing the idyllic Urupukapuka Island – the largest in the heavenly Bay of Islands – to base himself. Who can blame him? In 1927 he had a camp and lodge constructed at Otehei Bay on the island. This was called the Zane Grey Sporting Club, and it quickly became a major attraction for wealthy and famous travellers from around the world. The remains of these buildings can still be explored today on the Urupukapuka Archaeological Track, and make for a fascinating encounter with New Zealand’s early 20th Century history. In addition to his 57 Westerns, Grey also released 8 books about fishing throughout his career. One of these, the beautifully-written Tales of the Angler’s Eldorado, was penned in 1926 about his time in New Zealand. He tells of some of his best catches in the region, described his saltwater and freshwater fishing experiences, and detailed many of New Zealand’s uniquely wonderful environmental and geographical characteristics. He also wrote many articles for international sporting magazines over the years, which described New Zealand, and in particular the Bay of Islands, as a world class game fishing region. 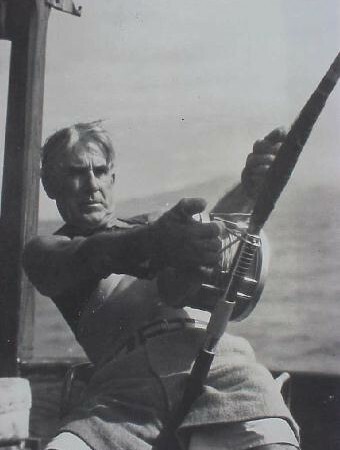 He is widely credited today with playing a huge part in the foundations of New Zealand’s modern fishing industry. Well, we can’t really argue with that.